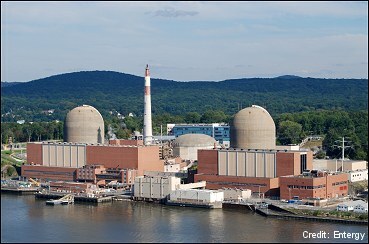 I went on my fourth tour of the Indian Point Energy Center yesterday, which is the location of the Indian Point nuclear power plants. I toured both reactor plants (Units 2 and 3). I fell in love with Indian Point the first time I saw her (2001). She is a wonderful facility sitting on the bank of the Hudson River with beautiful mountains in the background. On the train going up to the plant, it was early morning and the clouds were hanging low, clinging to trees on the mountaintops. I love that train ride. It is very peaceful and beautiful. Upon arriving at Peekskill, I decided to look around a bit because I was about an hour and a half early. Peekskill is a bucolic town. For some reason I decided to walk to the plant site. I usually just take a taxi. It appeared to be 3 or 4 miles away and I walk at least 12 miles a week. I walked past a yacht club and down a back street about a mile, then had to cut through the woods to get to the train tracks (MTA/Amtrak), where I walked another mile and cut through an area to get back to a street that led to the plant. It is beautiful around the plant. Fall is beginning and the leaves were beginning to change. There are wetlands nearby. Just before I got to the perimeter fence for the site, I saw two deer. And they saw me and started to run. One stopped to eyeball me and I waved. The deer just looked at me for a moment before it disappeared into the woods. I walked past the natural gas pipeline right of way that runs through the Indian Point site. After about 3 miles of walking, the last mile to the plant was uphill. I could see the highpower lines that come out of the site and knew that I was near. When I walked inside I was sweating profusely. I had a pack on my back that carries my nebulizer. After letting officials know that I was there, I went into the bathroom, washed up and changed clothes. Patrick Falciano, President, Nuclear Renaissance Services, conducted the orientation and the tour. He always does an incredibly thorough job. The tour group today consisted of Frank Fraley, President, Mount Vernon Chamber of Commerce and myself. Entergy spokesman Jerri Nappi also joined us on the tour. I am always amazed by the scanning and security involved in entering a nuclear power plant site. But I don't discuss those details. We observed the dry casks housing spent nuclear fuel. We also examined the Ristroph fish (fish screen) protection system down by the river. I have toured 9 nuclear power plants all over the United States, one nuclear power plant and a nuclear fuel reprocessing facility in France and two nuclear plants in China. This was Mr. Fraley's first tour of a nuclear power plant. It was an excellent tour and included some additional stops that were not included on my other 3 tours: backup generator building and control room. The site has multiple backup power generation sites that are more than adequate to provide power for cooling water in case of emergencies. We went to the spent fuel pool room. We went into both generation buildings. I love these tours because I always learn something new.